An epic day in a Wild Place is made with two ingredients. First, it requires a healthy mix of uncertainty and adversity. Second, it is best enjoyed when you don’t believe it can happen to you on the day you don’t expect it. This parka packs a punch – it’s very lofty, with big baffles, 900 fill down, and 10d fabrics. It’s the highest warmth:weight garment I’ve ever owned. So within moments of the sun peeking over the horizon this morning and delivering its blazing rays into the east-facing opening of my tarp, I was overcome with the suffocating sense that I was trapped in a feathery oven. In a panic, I shot out of my tarp, rolled onto the dewy tundra grass, stripped down to my underwear, and started panting, inhaling gulp after gulp of fresh cool mountain air. Then I felt a raindrop. Incredulously, I looked behind me to the west and observed the Armageddon-gray clouds of another storm. I turned back to the east and swear I saw the sun wink at me. Then, remembering that not only was I standing in my underwear, I was rapidly getting wet in the process. Still wiping sleep from my eyes and having no interest in spending a great deal of time processing the confusing circumstances that I found myself in, I dove back under my tarp and into my sleeping quilt. Three seconds later, the deluge hit, and the wind was blowing it all directly into the open end of my tarp. In no state to argue with Mother Nature or God, I simply denied that anything dramatic was happening, draped my rain jacket over my head, put in earplugs, and went back to sleep. I awoke an hour later to scattered sunshine, dry skies, the chattering of a pika scampering in the talus behind my tarp, and an intense craving for a cup of coffee. This is the part where we took the possibility of an epic day for granted. Heck, we only had about a four and a half mile walk. So we lounged around camp. We scrambled in talus, read books, wrote in journals, composed music, talked to pikas, and rested in a beautiful place. The trek from Cleveland Pass into Ottoson Basin is not to be missed. The trail is carved into talus below The massive cliff bands on Mt. Cleveland’s west face, and then drops into the serene meadow tundra and subalpine forest of the lower basin. There is no trail past Mt. Cleveland, and the walking is easy and beautiful. We were headed to Upper Ottoson Lake, from where we’d then veer to the northeast to ascend the high col on Explorer Peak’s west ridge en route to Crater Lake. We arrived at the base of our objective late in the afternoon, less than a mile and a half from our hopeful campsite that night. The ascent to the col was steep, through talus and tundra, but otherwise uneventful (Class 1+). We arrived at the top with incredible views of tomorrow’s objective – Red Knob Pass – and the gigantic upper basin of the Lake Fork. Cliff bands seem to protect the entire descent into the basin. I spent some time scouting a route up the west ridge of Explorer Peak and found a way down through the first major cliff band via a series of scree-coated ledges. I couldn’t see beyond those ledges and wasn’t completely confident that we’d make it all the way down. The backup plan: spend an extraordinarily uncomfortable night on Explorer Peak’s northwest face, or climb back up and sleep on Explorer’s west ridge, or go all the way back down to Ottoson Basin, which would have required a nighttime descent of a steep talus field. None of these were great options, so we proceeded down the face, hopeful for something to open up. After making it through the first cliff band, we downclimbed a short Class 3 section and then traveled north on a system of exposed ledges above another cliff band, which appeared more problematic than the first. I left my pack and the rest of the party and scouted ahead for a route down, which took a precious 30 minutes. After briefly paying respect to a golden eagle carcass rotting in the talus, I finally found a difficult but doable Class 3 route through the lower cliff band that would take us to a scree field leading to the basin. I cairned the entrance at the top of the descent and returned to the rest of the guys waiting above. A 12-foot vertical cliff band that we’d have to downclimb (Class 4). I retrieved my 1/8″ Spectra bear bag cord, created a giant knot in one end, and chocked it into a crack on the wall above us, then tied a bunch of hand loops in the cord. I clipped my 45 pound pack to a carabiner and gently lowered it to the bottom of the cliff band. I then down climbed the vertical face, which thankfully had terrific hand and footholds for my not-designed-for-climbing Altra Lone Peak 2.0 trail shoes. As we put on our packs, alpenglow was waning on the high peaks surrounding us. Sunset had arrived, darkness was looming, and we were still high on Explorer Peak’s northwest face. We traversed more ledges southward on thin scree overlying downward sloping bedrock shelves, using tiny bushes for handholds – or at least, for the illusion of handholds. Finally we reached a skiable scree gully that helped us lose lots of elevation quickly and safely, finally depositing us into a moderate descent of easy talus that led to the base of Explorer Peak’s west ridge and a flat basin meadow! Whew. We dodged a bullet. It was dark now, so we put on our headlamps. Clouds came in from the valley below and engulfed us in a blinding mist that made it impossible to see more than a few yards ahead of us. So I figured we’d just take a compass bearing towards Red Knob Pass and stop when the camping looked good. During our nighttime tramp through meadows and bogs, we heard a thunderous roar behind us – a giant rockslide that lasted several seconds, coming from Explorer Peak’s west ridge. And so, here we are late at night settled into a nice meadow with Explorer Peak looming overhead and a tiny brook babbling nearby. We have no idea what type of scene we will awaken too. That excited us! Stars have been replaced by the blackness of thunder clouds, and we hear the booming is the distance. All is well. It’s been a five star day. 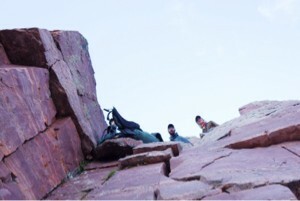 Photo: Eden and Chase peek over the final vertical cliff band we down climbed as Daniel lowers a pack down to me.